After another day, Parker went to bed. However, not all would be well this night. Parker was attempting to fall asleep when he heard noise in the ceiling above his room. Pushing his blankets off, he sat up to look around. It was dark, but he could make out movement on the ceiling air duct. Just then, something fell down into his crib. He backed up, startled, and then a pleasant odor caught his nose. It smelled like the one back at the motel, and yet, it was different. Parker suddenly lost control of his body. Standing up, he jumped and grabbed the side of his crib. He pulled himself up and lifted his legs over the side. He then let go and landed on his diapered rump, which caused the back flap of his pajamas to come undone and expose his attractive padding. Getting to his feet, Parker, left his room and went over to the front door of the apartment. He climbed up on a chair to undo the lock. Getting down, he opened the door and went out into the hall. Parker walked towards a figure in the dark. It was a green dragon with a purple belly and a velvet Omutsu diaper. “Yes, yes. After all these years, my dream will finally be realized!” He muttered, smiling big. 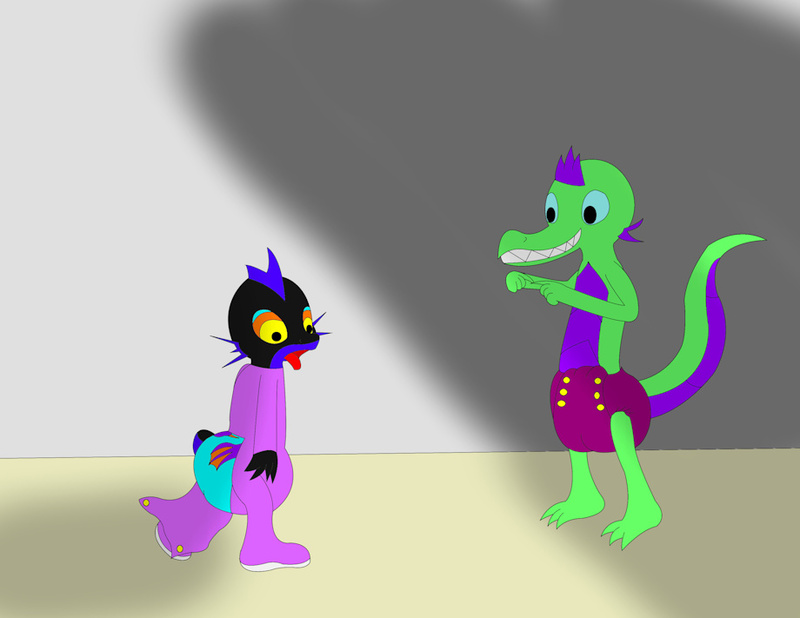 Taking a strange smelling handkerchief, the dragon covered Parker’s nose, which caused the baby dragon to fall unconscious.